Two sessions daily Monday-Saturday in the summer. Other times by appointment for groups of 4 or more. Meets at our log cabin home in Chugiak. 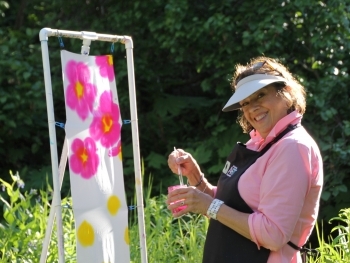 Paint by the creek on nice days — Indoors on chilly days. All refreshments and Alaskan High Tea meal service included. Nine designs and dozens of colors. Option to paint a second scarf. Adults: $89, children age 6 to 12 (small scarf): $29.95. Our daily sessions end after Labor Day, but we never stop painting! We offer Premium at our cabin for groups of four or more. Come paint by a warming fire and enjoy the complete Premium experience. Or we can accommodate groups of 8 or more at your gathering or workplace. If you’d like to book a private party at our cabin — or to book a mobile party at another location please call us at the number listed below. 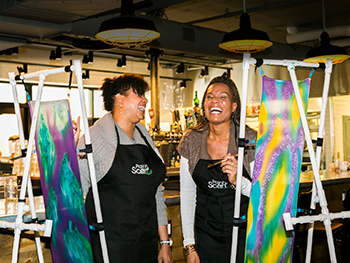 Paint a Scarf Pub brings scarf painting to a restaurant near you. Choose from our four most popular designs. Train and paint in less than an hour. 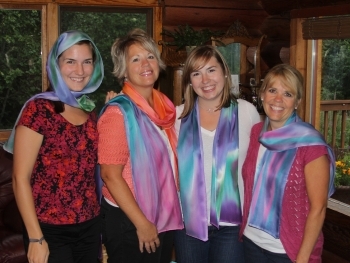 Then while your scarf dries enjoy a satisfying meal or share a drink with friends (at your own expense). Go home with a full tummy and beautiful scarf you painted yourself. Our Paint a Scarf PUB team is currently on vacation for the summer. We’ll add autumn painting dates soon.